First, you need a vision, also known as a goal. It needs to be something you want to create or achieve. If the end state of your vision feels exciting and invigorating, then you are on the right track. The best visions also feel a little overwhelming. They look like they might be too big to accomplish! My vision was to weed the front yard by hand. I could see the finished product of a beautiful expanse of chemical-free grass. I wanted to create it. I looked forward to spending time outside, and I was committed to using as few poisons as possible. However, you can see from the picture that it was a big yard, and there were a lot of weeds. I couldn’t face it all in the beginning. It seemed like too much for one person to accomplish. So, I chunked it down into smaller pieces. I decided to start with just the grass on one side of the sidewalk that led to the front door. 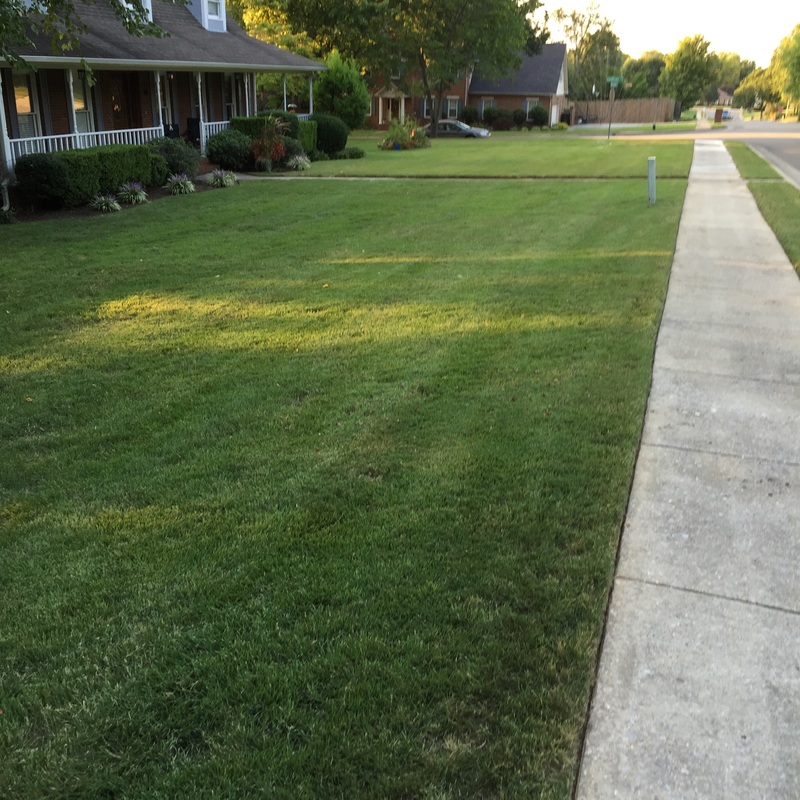 From that area of grass, I picked a smaller piece that was directly in front of the house. It would give me a beautiful weed-free view out of my front windows. I created a grid on that first piece. I started at the house and worked my way down the sidewalk. When I got to the sidewalk that runs by the street, I turned around and did the next strip back to the house. I went out at dawn when it was cool, and I would work for an hour or so. It took me about a week to get that small section done, but it looked great! I could see the possibility for the rest of the yard. Anything I did was an improvement. Then, I took on other pieces of the yard. I set time limits and concentrated on the process. I celebrated each accomplishment. Each section that I completed gave me more confidence and motivation. I began to believe that I could get the entire yard done. I used the same method of Chunking Down the Vision when I created my first online course. I had “Create online classes” on my to do list for years! It was a big vision, a huge goal that was completely overwhelming. Finally, I chunked it down into smaller steps and got started. The first item on my list was “Find a web designer.” Finding a web designer that could see my vision and wasn’t intimidated by it took about six weeks of interviews. Then, I started working on down my list of small tasks. The big difference between weeding the yard and creating an online class was the predictability. The weeding process didn’t present many surprises. Maybe there were a few more weeds than I expected sometimes. I did learn that only a few cute clover leaves can mean a gridlocked mess of roots. However, I just took it section by section and everything went according to plan. The creation of the online class took me places I never planned to go. When I started recording the first video, I had to do it over so many times that I couldn’t stand to do it again. So many things about it were not good. I took my first detour off of the planned path by creating YouTube videos to practice. YouTube videos weren’t in the original plan, but I needed to master recording video and audio before I could move on. It took lots of tries and in the end I owned a camcorder, an external audio recorder, and I knew how to edit videos in Adobe Premiere. Once I figured out how to create acceptable quality videos, I was ready to begin recording the class again. Learning about video and audio wasn’t one of the original steps, but it came up. So, I broke that new goal down into small steps and got it done. You can use the same system for your big vision. First, is it a vision or goal that you really want? I get such a feeling of peace and satisfaction when I look out over my weed-free, chemical-free lawn. Does the vision of your finished product or outcome make you feel motivated? Second, is the vision big enough? The best goals are big ones that feel a little overwhelming. Doing just one thing a day will move you toward the finish. Once you get started, it’s easier to keep going. Fourth, celebrate the chunks. When you finish one step of a process, bask in the glory for a few minutes. Revel in the feeling of accomplishment. When I finish writing this article, I am rewarding myself with 15 minutes outside in the grass. Finally, don’t be afraid of the unplanned detours. Sometimes you get a shortcut. Sometimes you get a longer scenic route. Stay on the path toward your vision and you will get there. For a little bit of fun leadership development, join 53 Leadership Challenges at http://bit.ly/29RYzx0. Want to go further with your professional development? Check out the courses offered at http://bit.ly/29PcAQD. Thanks, Rose! I had a lot of time to think out there in the lawn.